A magnetron is a device useful for generating lots of microwave radiation, most homes have magnetron's which use roughly 1kW of microwave power for heating food. A magnetron acts like a diode, when the magnetic field between the inner cathode and the outer anode reaches a certain level, electrons starting at the cathode will not be able to reach the anode. 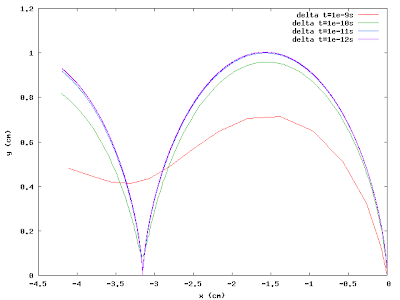 This level of magnetic field is known as the Hull cut-off magnetic field of the magnetron. Suppose we have a simple planar magnetron with constant E and B fields. 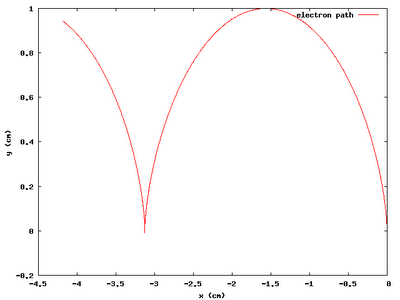 The path taken by an electron starting from rest at the cathode is governed by the relation of the time rate of change of the particle to the forces on the particle caused by the E and B fields. Gauss and Ey = −1/3 stat-volt/cm is shown in the figure below. can be calculated with a matrix-vector multiply. Our implicit integration operator then just has a few slight modifications, and the right hand side now includes n and n − 1 terms. The second order method achieves something closer the "correct" shape much more quickly than the first-order scheme. This analysis ignores any losses due to radiation from the accelerated particle (which of course is why magnetrons are useful in the first place). Leave a comment if you'd like copies of the Octave and Python scripts used to calculate the numerical solution; I can email you a tarball.